Wholesome Meal is a company that makes snack bites that are high in protein, gluten free and organic. They come in five different flavors including chia chocolate, peanut butter, sunny honey, nutty monkey and cranberry almond. Each small bite contains 4 grams of protein which makes for a filling and nutritious snack. One bite contains 55-61 calories. For a snack, I would have two to three of these. They come in little round balls and have a chewy, crumbly texture. My favorite was the peanut butter one. After a meal one day, I had my family try the different flavors. They liked them a lot. My brother was a fan of the cranberry almond and my mom liked the peanut butter. 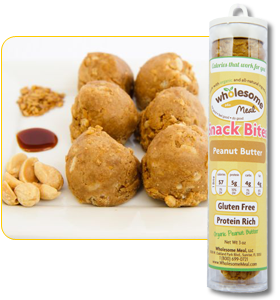 These bites are made with real ingredients such as organic peanut butter, almond butter, whey protein, chia seeds and sunflower seed butter. I would definitely recommend these for a filling mid-day snack. I keep these in my desk at work and eat a couple mid-morning when I am getting hungry before lunch.